Regular moderate wine consumption has been associated with several health benefits in adult individuals. However, the risk increases drastically with each drink above moderation! Drinking more than what is recommended in the guidelines will not provide more benefits, only more harm. This widely accepted association is represented in the J-curve. However, not only the amount but also drinking pattern is believed to be relevant when considering the health aspects of alcoholic beverages. It is better to drink moderately and regularly with the meals than to drink the same amount at a single occasion. 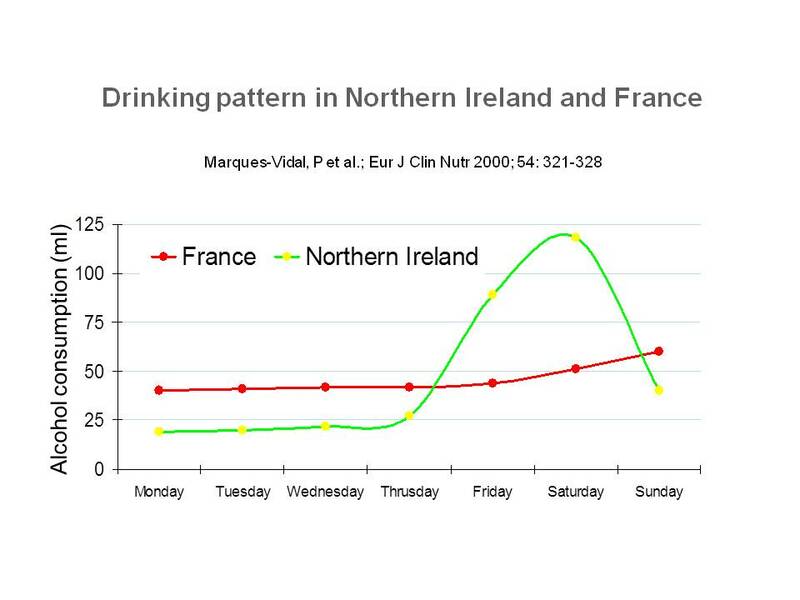 For example, the data of those who drank alcoholic beverages regularly in Ireland and in France were analysed. In Ireland, beer and spirits are the preferred drinks and most alcohol tends to be consumed on the weekends whereas in France, most of the consumed alcohol comes from wine and it is drunk every day. Comparing these two different drinking cultures, only wine drinking was associated with a lower risk of heart attack and/or stroke after adjusting for confounding factors. No significant risk reduction was found for beer or other alcoholic beverages. The researchers concluded that regular moderate drinking is associated with a lower risk of coronary heart disease (CHD), whereas episodic or binge drinking increases the risk. Furthermore, they suggest that wine associated drinking behaviour is at least as significant as wine consumption as such. Moderate daily consumption of alcoholic beverages, mainly in the form of wine and usually with meals, is considered part of a Mediterranean diet and lifestyle. Growing evidence indicates that the Mediterranean diet (MD) is beneficial to human health. A MD is characterised by a high intake of vegetables, legumes, fruits and nuts, minimally processed cereals, moderately high intake of fish, high intake of olive oil, low-to-moderate intake of dairy products, low intake of meats and a regular but moderate consumption of wine. Many epidemiological and research studies have reported that this diet pattern is able to limit the development and progression of coronary heart disease, the leading causes of morbidity and mortality in both developed and developing countries worldwide. There is now a large consensus about recommending a Mediterranean diet to reduce atherosclerosis and coronary artery disease and to limit the risk of fatal complications such as sudden cardiac death and heart failure. Evidence is also accumulating that wine helps to prevent the development of certain cancers (see cancer). Other studies suggest that elderly people who adhere to a Mediterranean-type diet, including moderate intake of wine and other alcoholic beverages, may be at lower risk for cognitive decline in old age. The researchers explained the effects by the wine's potential role in protecting from brain damage. Traditional Mediterranean foods may also reduce oxidative stress and inflammation which is thought to be involved in Alzheimer's disease. Conformity to the traditional Mediterranean diet may also be associated with lower breast cancer risk among postmenopausal women and could explain, in part, the lower incidence of this disease in Mediterranean countries. Moderate drinking guidelines are set by governments, so that any potential harm to the human body is minimized and any potential benefit is maximised. Exceptions are young people, combining alcoholic drinks with certain medications, during pregnancy and with a history of addiction. Some guidelines include recommendations to drink with food, to alternate alcoholic and non alcoholic drinks and ‘to pace’ drinking. · No more than 4 drink units on any one occasion. The above summaries provide an overview of the topic, for more details and specific questions, please refer to the articles in the database. Alcohol consumption by youth: Peers, parents, or prices?